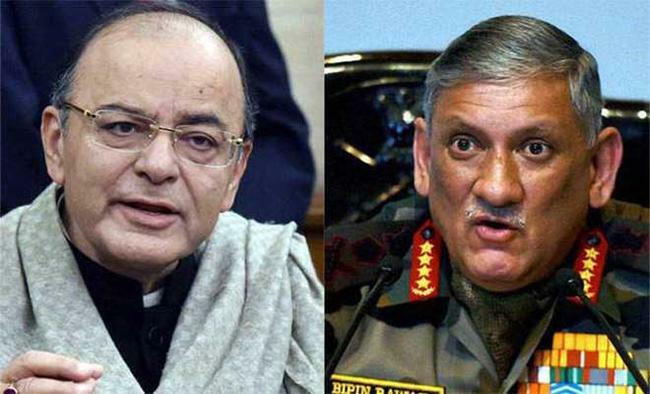 Srinagar: Defence Minister Arun Jaitley and Army Chief General Bipin Rawat will arrive here in Jammu and Kashmir on Wednesday to review the security situation amid heightened tension on the Line of Control (LoC) and student unrest in the valley. This would be Jaitley's first visit to the state after he took over the additional charge from Manohar Parrikar. The Defence Minister advanced his visit by a day since he was otherwise scheduled to chair the two-day long Goods and Services Tax (GST) council meeting beginning here on Thursday. During his visit to the LoC, Jaitley would meet the field commanders. He will be briefed on the overall preparedness of the army to meet challenges of ceasefire violations by Pakistan and the heightened risk of infiltration as the snow starts to thaw on the mountains. Sources here said the ongoing students' unrest fanning separatist sentiments in the valley would also remain in focus. "The impact of an unrest on the overall security situation cannot be wished away. Therefore, the visit will also focus on ways and means to help the civil administration bring the situation under control," a top official told .